Let me tell you a little story about a man named Joel, who loved his traditional green bean casserole. But being his wife, who didn't' like living in strife ~ figured out how to make it that much more!! Okay... for real though. 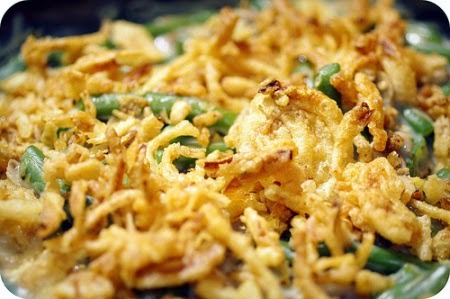 My husband does like green bean casserole but for me it was always so bland, so boring that it wasn't worth the calories. I would skip over it time and time again. Now those crispy onions on top ~ heck yeah I would eat those.. but geesh. So ... this year I wanted to try something new with the traditional and I have to say it was a HIT and even made me a fan!! I am sure I will be making that again soon ~ no need to wait for a holiday or special occasion when God makes everyday a special occasion. In a large bowl, mix together everything except for the French Fried onions. Pour into a casserole dish and bake at 350* for thirty minutes. Top (spread over the entire top) with the container of french fried onions and place back in oven for five to seven minutes or until onions are crispy on top.